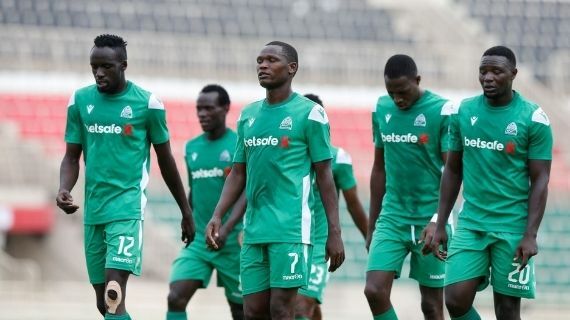 Kenyan Premier League champions Gor Mahia will hold their final training session on Monday afternoon ahead of Tuesday’s historic friendly match against English Premier League side Everton FC at their Goodison Park Stadium. The 17-time Kenyan champs landed at the Heathrow Airport in London at about 3:30pm Friday before taking a two-and-a-half hour train from Central London’s Euston Station to Liverpool, the host city for their week-long stay. K’Ogalo players were in high spirits with skipper Harun Shakava vowing they will give their all for the friendly to showcase Kenya’s football talent. “Just like the coach told us, we are not here necessarily to win, but to show everyone what we can do. We are happy to be here and we are up to the challenge. We thank our sponsors SportPesa for giving us this chance because for most of us, it is a once in a life time opportunity,” skipper Harun Shakava said after the team arrived at Heathrow. Gor Mahia chairman Ambrose Rachier who is accompanying the team noted that the team has a brilliant opportunity to show the whole world what they have to offer and challenged the players to give their best. “From what I have gathered from them they are extremely excited, some have never flown out of Kenyan borders. Playing against an EPL side and on English soil, that is something that is very exciting to them and we hope they can show their best on the pitch,” Rachier noted. The team will have their final training session at Finch Farm on Monday afternoon while the match is set for 7pm Tuesday (10pm Kenyan time).